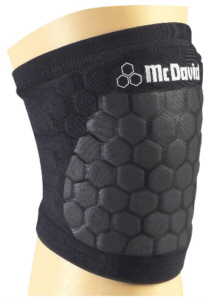 Great knee and elbow protection for Volleyball and other court sports. 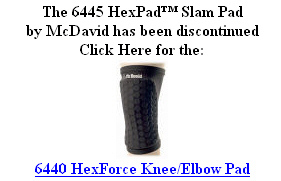 The Hex™ Slam Pad features Hexpad™ Technology integrated into a new low profile, form-fitting knee/elbow pad. Individually laminated pads fit better, move with your body and breathe enhancing comfort. Specially designed tapered cut behind the knee allows a full range of motion, added comfort and mobility. Ultra hDc™ Moisture Management Technology helps keep you cool and dry. Teflon® patch enhances durability from high abrasion surfaces. Small Up To 100 lbs. Up To 175 lbs. Medium Up To 175 lbs. Up To 225 lbs. Large Up To 225 lbs. 225 lbs. to 250 lbs. X-Large 225 lbs. to 250 lbs. Over 250 lbs.